Two short weeks ago I challenged myself to complete one project a week for the next seven weeks. I’ll be honest, I already kind of failed, but I figure if I have seven projects done at the end I’ll be proud of myself. I made the rules after all right? I say “kind of” failed, because my week one project took about one and a half weeks as it was a bit more complex than I had planned for. If you’ve seen my Instagram, you know that a few weeks ago the two lap belts I ordered finally arrived and I was excited to get them onto a project. This time around I must have fell and bumped my head, because I never competed a full sketch of the project! Instead I just started from what I knew how to make and strove to make it look as much like my main inspiration picture as possible. It either says something about my reverse engineering skills or my sheer luck that the backpack tuned out as well as it did, but that’s a discussion for later. Looking at flap backpacks on Pinterest I figured that a flap backpack or drawstring backpack are in general nothing more than a tote bag with flaps and/or drawstrings added. Luckily, I have making square bottom tote bags down to a science. All I had to do was measure another backpack I had that I liked the size of and add some extra L X W for the seam allowance. I decided I wanted the bottom of the bag cut on a fold so that the base would all be one piece and the sides would need to be stitched up. Next, I added the accent leather (pleather?) fabric on top of the main upholstery weight leopard print fabric. I debated putting an outside pocket on the back of the backpack, but in the end decided to leave that for the bags next improved iteration. Embarrassingly, I accidentally stitched all the accent fabric on before adding the bottom half of the lap belt and had to remove some of the stitching, so I could slip in the lap belt. It was no big deal but felt like a rookie mistake. It was at this point that I took a break to think out the design more before I made a mistake that would be hard to fix. Since I didn’t have a detailed sketch I spent a lot of time mentally working out the different options for reaching my end result. I asked myself questions like: When should I add the flap, should the top half of the buckle go on top or underneath the flap, how do I keep the heavyweight Pellon interfacing in place at the base of the bag?Although these were important questions to ask myself, I think they were also mixed in with a good amount of procrastination. In the end, I inserted the bag lining with an added pocket (see the cute bee print fabric) and then added the flap. I decided on splitting the top portion of the buckle into two pieces. I left the adjustable strap out and the part attached to the buckle was sewn onto the end of the flap. I also used some of the leftover belt to make a grab handle on the top of the backpack. The most stressful part of making any bag is always inserting the lining for me. I’ve tried all the methods, but somehow, I always seem to misjudge the lining and must adjust. *Facepalm* The thickness of all the layers is also a stressor for me and with this bag it was especially stressful. With my upholstery weight fabric, lining fabric, two-layered flap and two-layers of belt buckle I had my machine put to the test! Ruby did remarkably well given all I (literally) put her through. Honestly, all the needles I broke on this project are entirely on me. 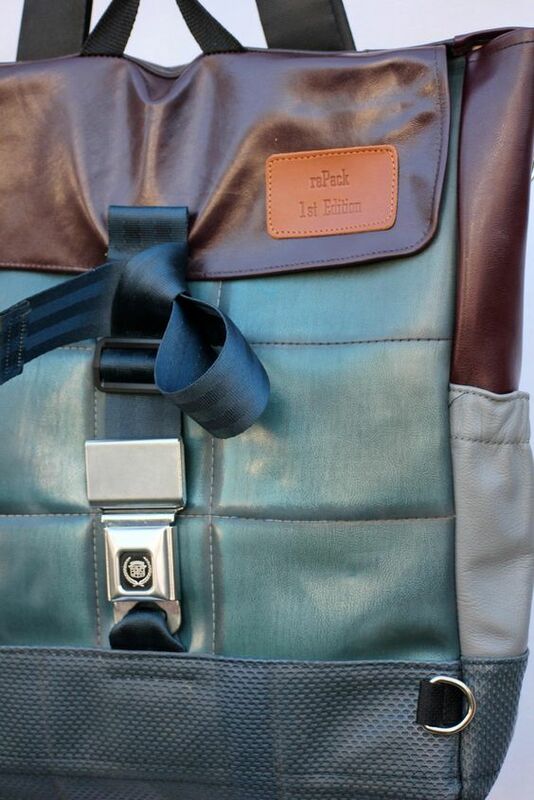 I learned a whole lot about the right mix of speed, needle type and stitch length making this backpack. Anyways, sorry there aren’t more pictures of the process! I’ll do better next time. I think with my lack of planning and extemporaneous sewing (is that a real phrase?) I was afraid the process would be especially ugly; I wasn’t wrong, but I’m sure now that would have only made it that much better to share with my readers. Embrace the process and all that. In the end, I ended up with a beautiful, heavier than standard backpack, that’s great for carrying the essentials and a light laptop or tablet. Let me know what you think in the comments. I’m already preparing a list of what I’d do better for next time. See you in a bit, when I reveal how Week 2’s project went.